Not your mother's Lazy Susan, Beatriz Ball's inspired version features gleaming sandcast metal handles affixed to a spinnable 18" circle of rich tropical hardwood. 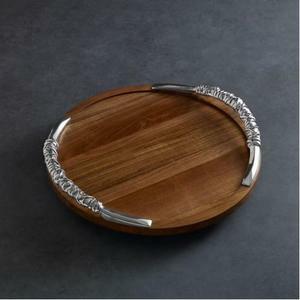 The textured metal handles, resembling strips of leather, are a notable feature of the hefty Soho 18"" Lazy Susan from the CUTTING BOARD Collection. Ideal for serving your favorite cheeses or charcuterie.